The third edition of Concise International and European IP Law. TRIPS, Paris Convention, European Enforcement and Transfer of Technology is an incomparable practical resource for practitioners, providing comprehensive coverage of rules, practice, and procedure of intellectual property law. 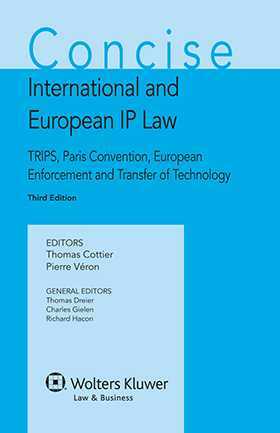 The editors, Thomas Cottier and Pierre Veron, supported by an author team of 26, bring their considerable expertise and experience to the third edition to produce article by article commentary and analysis on the instruments of intellectual property law. The rules of intellectual property law can be complex but the third edition of Concise International and European IP Law. TRIPS, Paris Convention, European Enforcement and Transfer of Technology brings clarity with a straightforward explanation of the principles of law to be drawn from each provision, supported by analysis of the latest relevant case law. Produced in an easy to use format, the book sets out and annotates the provisions of the TRIPS Agreement – backbone of international property protection – followed by text with commentary on the Paris Convention and the key instruments in European Union Law. uniform conflict-of-law rules relating to non-contractual obligations. Concise International and European IP Law. TRIPS, Paris Convention, European Enforcement and Transfer of Technology is an easy to use resource that provides a rapid understanding of all provisions of European Intellectual Property Law. Agreement on Trade-Related Aspects of Intellectual Property Rights. Regulation No. 44/2001 of 22 December 2000 on Jurisdiction and Enforcement of Judgments in Civil and Commercial Matters. Regulation (EC) No. 864/2007 of the European Parliament and of the Council of 11 July 2007 on the Law Applicable to Non-Contractual Obligations (Rome II). Council Regulation (EU) No. 608/2013 of 12 June 2013 concerning Customs Enforcement of Intellectual Property Rights and Repealing Council Regulation (EC) No. 1383/2003. List of Treaties, Legislation and other Documents. List of Cases and Advisory Opinions.